One of the things I’ve struggled with through the years is how to keep my online staff busy day in and day out. 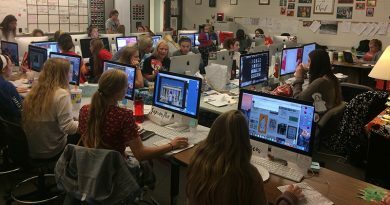 Don’t get me wrong, there are always things to do, everyone is just not moving the same direction day in and day out like my newspaper staff is. The web staff has always been a bit more like the wild, wild west with people working on social media, others creating content and some simply keeping the site functioning. In my attempt to organize the chaos a bit this year, I’ve tried implementing a few things to give the web staffs a bit more guidance and not let days go by where everyone is sitting around wondering what’s actually been accomplished. Over the course of the next couple of weeks, I’m going to share some of the calendars I’ve created to make things a bit more organized. The verdict is still out on what I’ve created and how it’s all going to work, but I thought it would be good to share now in case someone else was looking for something similar. I asked all the students on the FHNtoday staff what they liked doing. This falls in line with my Rule of 3 system that I’ve used for years and my philosophy behind it. I then went ahead and tried to lump their interests into similar jobs and then created the following categories: Edit Content, Write Stories, Track Analytics, Maintain the Site and Publish a Weekly E-Newsletter. To give them a little more guidance each day of the week for the different things they will be doing, I also created this day-by-day weekly calendar. Some of the calendar items have different things to do each day of the week, others have more of a general guide/checklist for the week. 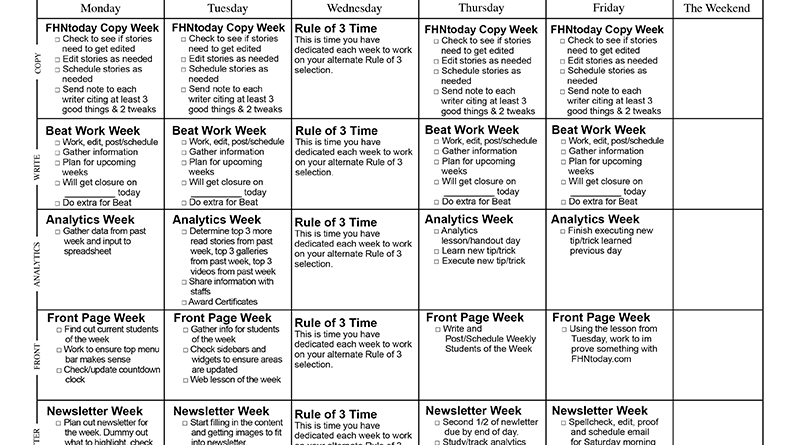 The system allows students to do something different each week to vary up their responsibilities a bit. I’ve found that having someone do the same thing day after day gets a bit too trite. Giving them a break so they aren’t copy editing stories every day of every week keeps them be more fresh when they are on for the week and helps make their fixing and feedback better. 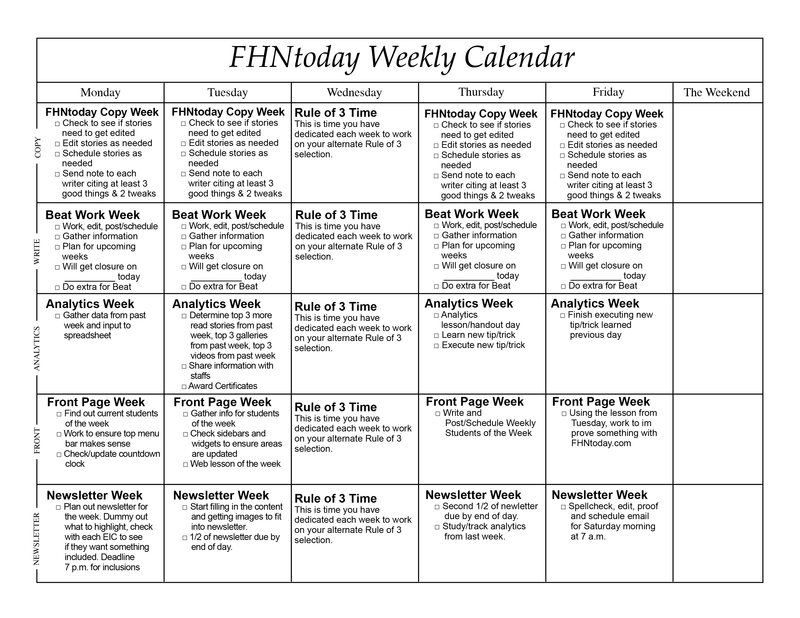 You can download a copy of what I’m working on with my FHNtoday.com staff here. COPY: This person will be charged with editing and scheduling stories to post daily as well as giving feedback to writers. WRITE: For one week out of the cycle, some people will be given the week to work on a story for the website. ANALYTICS: For this rotation, staffers will dive into the Google Analytics a bit to track visitor data, share top stories from the past week with the staff and analyze and use the data to adjust coverage moving forward. FRONT: The person on the Front rotation will essentially be charged with making sure the site is functioning properly, the homepage and sidebars and current and content is being rotated through on a daily basis. NEWSLETTER: To share information and promote the site, the team will be creating and emailing out a weekly newsletter to subscribers. In the coming days/weeks I will be sharing what I’m using with my social media team, the FHNgameday.com sports team and my advertising team which is also in the hour.